Georgetown Trust, in Partnership with Caye International Bank, provides you with the ability to borrow against your physical precious metal reserves stored in our secured vault in Zurich. You can now leverage your gold holdings to get more than just the security and comfort from your gold; you can actually utilize the cash value of your holdings to purchase investments of your choosing. Georgetown Trust and Caye International Bank will provide you with a secured Line of Credit based on the value of the gold in your segregated precious metal holdings stored in Switzerland. Your Line of Credit limit will represent up to 75% of the current market value of your gold holding, adjusted daily. The Line of Credit will be provided at a low annual interest rate and will be interest only with a 1-year renewable term. A minimum requirement of $100,000 US in gold holdings is initially required to qualify for the Gold Loan Program. Complete the form on the right to watch a special free video presentation on this unique Gold Loan Program by completing the form on right. P.S. 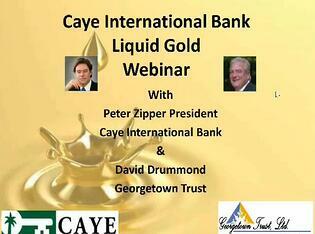 The Gold Loan Program is only available for Caye International Bank clients. To establish an account please contact us and we’ll facilitate that for you. Share this free information with your friends and colleagues.